Getting to Britain's "newest island” demands no more than driving about 25 miles beyond Hull and then, tides permitting, walking two and a half miles in either direction to reach the lighthouse. Spurn Head has been an occasional island ever since the tidal surge of 2013 severed the isthmus connecting the tadpole shaped-peninsula to Holderness. The sea took away the grassy dunes and the road they bore, leaving Spurn Head definitively connected to the rest of East Yorkshire only at lower tides. Access to the lighthouse, lifeboat station and Humber pilots' watch is possible only on foot or by Landrover when the waters don’t cover the sandspit. There was further damage during a storm surge earlier this year and the official policy is now to “let nature take its course”. In reality, the Spurn peninsula has always been a less than permanent coastal feature: it is the product of huge quantities of silt – from coastal erosion further north – washing down the Yorkshire coast with every tide. At Spurn that silt settles rather precariously on the remains of a moraine that once stood at the edge of a huge glacier. But the process appears to have a 250-year cycle, during which Spurn Head has always been, at intervals, an island. Base camp for Project Spurn Head was a very pleasant Airbnb, called East Lodge, near the tiny village of Winestead, close to Sunk Island – an area of land reclaimed from the Humber some time ago and itself a reminder of the ephemeral qualities of “dry land” in these parts. The world here has the air of passing at a slower pace and, driving through the village of Easington towards the car park for Spurn Head, there are signs that some natives are restless, amid clear suggestions that the onslaught of the sea is not the only issue disturbing the tranquillity. Large posters declare opposition to plans for a new visitor centre. Given that the current Yorkshire Wildlife Trust visitor centre is no more than converted shipping container and that the site of the new centre is some distance inland, the suggestion that the development would compromise the area’s wilderness qualities seemed rather tenuous. Walking through the dunes, we emerged onto the shingly spit that joins “Spurn Island” to the mainland. I was expecting a relatively narrow breach, but in reality a good half mile of duneland has vanished, leaving nothing to bind the land-bridge firmly together. 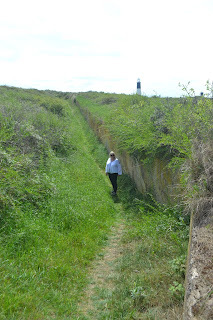 You can see the remains of sea defences erected during the First World War, but these are now well to the east of the high point of the spit, whose natural tendency is creep westwards. The walk across the shingle proved quite hard going, though sticking quite close to the water line on the western side offered probably the firmest footing. 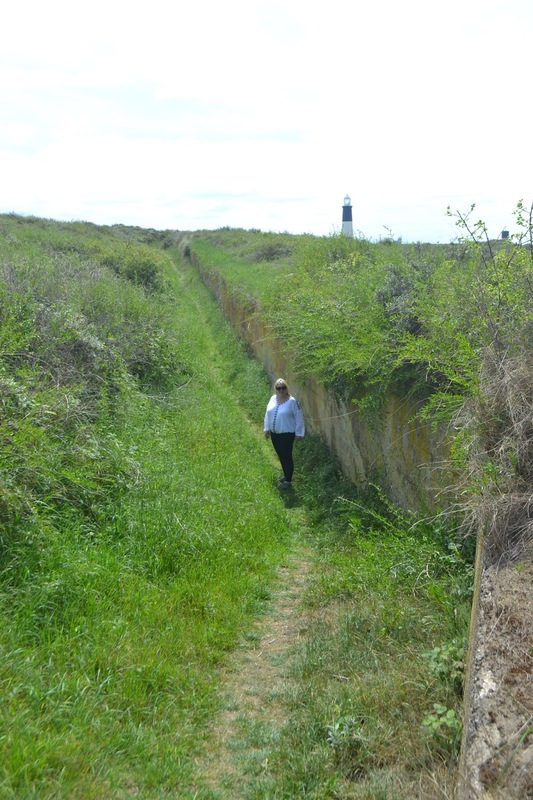 Clambering up onto the intact section of the peninsula, a tidal shelter for walkers offered a stark reminder of the precarious nature of the link. The area of dunes widened progressively, offering shelter from what was just the gentlest of breezes as we walked south beneath a warm early summer sun. Knots of birdwatchers trekked back and forth and – as a kestrel patrolled up and down the length of the peninsula – swallows and skylarks were among smaller birds filling the sky beneath it. A rich carpet of colourful flowers and grasses belied the flimsy nature of the land, while a collapsed stretch of road predating the recent damage, and stretches of railway disappearing at intervals into thin air were reminders of that very flimsiness. It seemed a long two and half miles to the lighthouse and, as temperatures rose into the 20s, so to did concern that we had set off minus refreshments of any sort. What relief then to find Wildlife Trust volunteers on duty at the lighthouse – restored and opened to the pubic with help from Heritage Lottery funds – and selling a range of crisps, chocolate and pop! I needed them even more after climbing 130ft of steps to the observation room. Two gallery spaces punctuated the climb, while an informative video gave rise to a rather surreal feel, thanks to being projected onto the curved internal wall of the lighthouse tower. Climbing the last few steps up the final “ladder” earned the right to enjoy a superb panorama, looking back up the Humber towards Immingham Docks, and the port and city of Hull, with the towers of the Humber Bridge just visible in the distance. To the south, huge vessels plied what seemed like a surprisingly narrow channel separating Spurn Head from Grimsby. The view served only to emphasise that the lighthouse remains some distance from the point itself, which lies beyond the pilot station and the former homes of the lifeboat crew’s families (all now live on the mainland). Indeed, I was reminded by the artist whose work was on display that this end of the peninsula continues to grow, with elements of the military defences now stranded well inland. He suggested that even the flimsy sandspit might be getting wider and taller again, although another tidal surge might yet change all that. After the long hike back to the car park, we felt a reward was in order and what better place to seek that reward than at the Crown and Anchor, in Easington – a pub enjoying unsurpassed sunset views across the marshes and up the Humber. In the immortal words of that son of Yorkshire, Wallace, it had been a “a grand day out”. It looked like someone had scrawled Tippex in splodgy lines along the mountain ridges to either side of Loch Ness, as the last remnants of snow shimmered in the Spring sunshine. For once, the weather was precisely as forecast – and this was vital to the success of Project Kilda. On landing at Stornoway, the windsock hung forlornly beneath a warm and windless sky, like a forgotten kipper in a smokehouse. Prospects were looking better and better! Project Kilda was a product of my having – somewhat prematurely, I hope – given a bit of thought to the idea of a bucket list. But it wasn’t so much the number of entries on this list that was causing me concern, as the seemingly relentless acceleration in the passage of time. Some of the entries – safari in Botswana, a flight in a Dragon Rapide or dining at Noma – could be ticked off reasonably easily, simply by creating time and finding the money. Getting to the archipelago of St Kilda, however, posed an additional challenge: the voyage to this British outpost in the North Atlantic is always at the whim of the weather. And the weather in these parts is indeed whimsical, being capable of delivering high seas and hurricane force winds in equal measure. I had secured my passage courtesy of Seumas Morrison, whose Sea Harris company runs seasonal day trips to St Kilda from the little port of Leverburgh. Seumas had given me a list of dates on which I might ride beside him on the navigator’s seat aboard his high-speed Redbay Stormforce 1650, Enchanted Isle. The boat was specially designed and built in County Antrim and Seumas took delivery at the end of 2014 – Sea Harris now offers, he says, “the fastest, greenest and most economical day trip boat operating from Harris”. Cruising at 22 knots, it makes the 45-mile crossing to St Kilda in two and half hours. Having previously kept no more than half an eye on the Hebridean weather charts, I began watching more assiduously at the end of Easter and felt my spirits buoyed as high pressure began to build across the north-west of Scotland in early May. It looked unusually settled, and so it was on Tuesday May 2 that I flew via Aberdeen to Stornoway, where I bought provisions and drove a little over an hour to West Harris – minus a booked bed, but plus my two-man tent, unused for about 20 years. The campsite at Horgabost most be among the most scenic on the planet and I found myself a pitch immediately overlooking the wide, white expanse of the beach. On previous visits to the beautiful Isle of Harris I’ve stayed at Hotel Hebrides, by the ferry landing at Tarbert, and at Blue Reef Cottages, not far from here on the magnificent west coast. It was while staying at the latter that co-owner Neil Campbell told me about a development of affordable homes for local people by the West Harris Trust, which manages a big chunk of land in West Harris for the benefit of the community. Besides affordable homes and studios for artists, the development includes a restaurant with quite stunning sunset views, the Machair Kitchen. And here’s the happy coincidence: it is run by Hotel Hebrides as a satellite of its own rather good restaurant in Tarbert. And it was just a mile’s walk from my tent! Having enjoyed a meal way beyond what might have been reasonable expectations for such a remote spot (and including a bowl of the finest local mussels) I watched the sun go down over the broad Atlantic, my ultimate destination somewhere beyond the horizon. The call of a cuckoo fills the air as, just after eight, a flotilla of three boats edges out of the harbour at Leverburgh, through the sound of Harris and into the open ocean. The conditions, says Seumas, are as good as they possibly can be for visiting St Kilda: there is no more than perhaps a two-metre swell as we head west, pausing only to admire a small school of porpoise at play. It’s a full two hours before the St Kilda archipelago shimmers into view and we sail past Boreray and into the horseshoe haven of Village Bay, on the main island of Hirta, from where, in 1930, the last 36 residents were evacuated to the Scottish mainland. The departure of the people marked an end to at least two millennia of human occupation – a fact astonishing enough in its own right, given the nature of the elements that afflict the four islands of St Kilda where land flat enough to cultivate is at a premium. 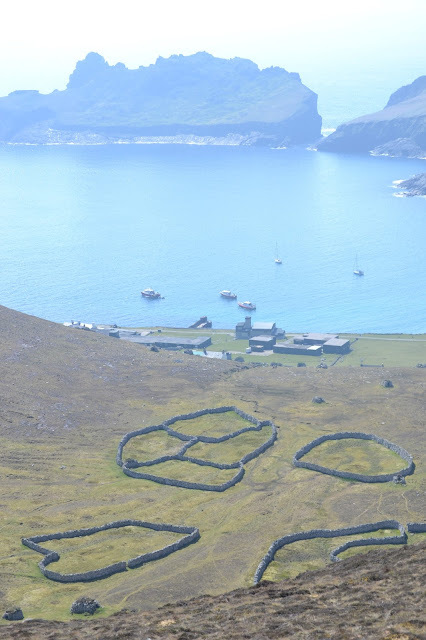 It is thanks to this remarkable story of defiant human habitation that St Kilda has, since 2005, been one of only a handful of double Unesco World Heritage Sites, recognised for both its cultural legacy and a rich natural heritage, including some of the largest seabird colonies in the world. Today, a couple of early-season yachts lie at anchor as we edge towards the little pier at the centre of Village Bay and prepare to disembark aboard a RIB. It is forbidden to moor at the pier itself, lest pests like rats should make it ashore and threaten the native fieldmouse and wren (both are rather special insular species, double the size of their mainland cousins), or indeed the eggs of seabirds. Clambering ashore, I can’t help but be immediately struck by the enormity of the power station plonked by the military right in the middle of the World Heritage Site. An archaeologist with the Scottish National Trust informs us that the military installations – personnel are stationed here to track rockets test-fired from the Isle of Benbecula – are about to undergo a complete rebuild. By the end of Summer 2018, the rows of green huts and the power station monolith will have been replaced by much less intrusive structures, designed to be sympathetic to their surroundings. The base was built back in 50s and 60s, when Cold War preoccupations trumped natural beauty and heritage every time. Today military personnel and scientists (of whom more later) are the only souls to brave the St Kilda winter, the National Trust presence being confined to the (relatively) benign summer months. The motley collection of day visitors is told we can wander where we like, except within the loosely defined military area. What has drawn us all here? Well, there has surely been more written per head of population about St Kilda than just about any other location in the world. And indeed, probably more metres of film exposed too. There is enduring fascination with the extraordinary lifestyle of the islanders, who survived by climbing down cliffs to catch seabirds – they even evolved a different bones structure in their feet, with wide spaces between the toes, helping them to climb ropes. And there is immense sadness at the slow decline of a community and its ultimate demise in the space of only about a hundred years. The causes for the decline were various but Victorian age tourism undoubtedly played a big part, introducing islanders to money in place of the tradition of paying at least part of their rent to their landlord, the MacLeod of MacLeod, in down and feathers. Given that it was estimated that each person on St Kilda ate 115 fulmars every year and that the annual puffin harvest in the mid-19th century was close to 90,000 birds, that’s a lot of feathers! Contact with the outside world saw the islanders becoming more reliant on imported goods, while also being lured away by the prospects of an easier life. However, the rot probably began to set in with the arrival of the first priests, who extinguished the rich cultural traditions of music and dance, and smothered the villagers beneath a blanket of fundamentalist zealotry that permitted the singing only of psalms. Disease also took its toll and when the remaining islanders finally asked the British Government to organise their evacuation, it was only the very young and very old who remained. After their departure, the neat arc of houses in Village Bay fell into disrepair though, more recently, some houses have been neatly renovated and now house the occasional civilian population. The last survivor of the evacuation, Rachel Johnson, died as recently as last year at the age of 93, having been eight when she left the islands. A procession of day-trippers snakes up the steep slope of the natural amphitheatre, behind Village Bay. We are aiming for a nick in the horizon, from where, we were promised, we would get a good view of the Isle of Boreray and of the cliffs on the island’s east side, home to what was the world’s largest colony of gannets until recently overtaken by Bass Rock, in the Firth of Forth. As I near the crest of the ridge, however, I am aware of another avian presence: a bonxie, or great skua. Anyone who has ever roamed the moorlands of the northern or western isles will know to be wary of this aggressive aerial thug. Unlike many other birds that will dive-bomb you but pull out before impact, the bonxie just keeps going and hits you as hard as he can. I’ve been thus attacked in Shetland and the Faroe Islands, but this bonxie lets me approach reasonably close, probably because he is yet to mate and has no nest to protect. Indeed, he is soon on his way, conducting an impressive aerobatic display with a female. At the skyline the land plunges sheer to the sea, amid a huge company of gannets, squawking and squirling, their yellow heads glinting in the sunshine. From here, you can stick close to the cliff edge and head for the summits of Connachair and Mullach Mor, each graced by white radomes, connected to the military base by a steep road. I gaze down on the panorama of Village Bay, at the heart of the remains of the volcanic caldera that loosely enclosed its glinting turquoise lagoon. Beneath such a sun it might just be Santorini – though minus the overpriced hotels. Village Bay from the ridge: it could almost be Santorini! I choose a more direct route towards the mountains, taking me past several lines of cleits, the stone storage huts found only on St Kilda. I have been aware of these structures, which were to the St Kildans as wooden slatted meat-drying sheds are to the people of the Faroe Islands. But I have never expected to see so many: they run in lines from Village Bay in every direction, right to the very mountain tops, more than 1,000 feet above the village. More than 1,200 of them have been counted. It adds a whole new meaning to the idea of popping to get food from the larder: it could have been an all-day expedition. I stumble across the remains of a Soay sheep, the ancient breed unique to the islands, and make a note of his ear tag number. Arriving back in the village I chance to meet a woman who seems weighed down by camera, lenses and binoculars. 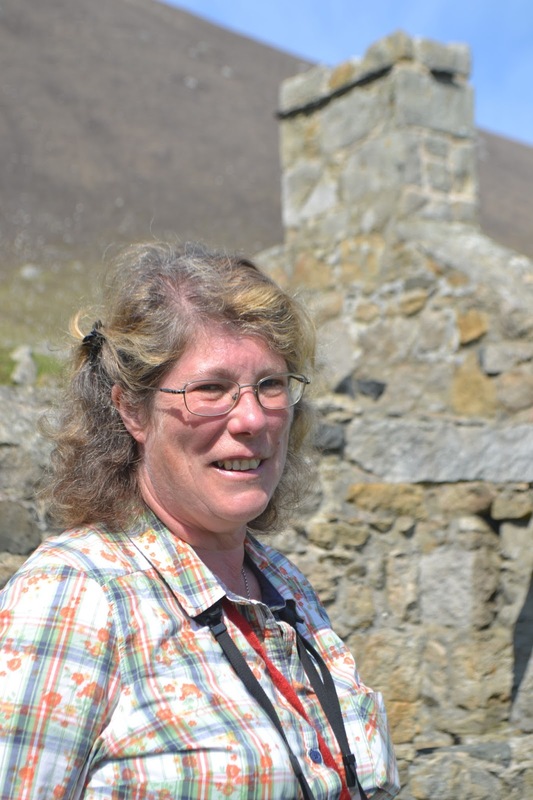 It transpires I am in the company of no less than Jill Pilkington MBE, head of the Soay Sheep Project, which is a long-term study of the little wild sheep, in part to gain a better understanding of their modern domesticised descendants. Jill is a parasologist, who is not, as she quickly corrects me, someone who studies umbrellas, but rather someone who studies parasites. In her case, sheep parasites. I share with her the number and location of the corpse I found and, indeed, a second one closer to Village Bay, and wonder why they might have died. “He was one of the frisky young bucks,” she tells me, explaining how these ambitious opportunists would seize their moment to “seduce” yews behind the backs of the herd’s four dominant males. But passing on his genes has come at a price as he was too exhausted to survive the harsh Spring, waiting for the new grass to come. “He would have died happy, though!” she adds. 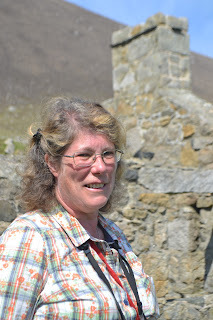 Jill is the nearest St Kilda has to a permanent resident and has been studying her flock for 27 years. Her “second home” is in Hexham, Northumberland, where she has, she says, a husband. I reflect that hers must be an unusual kind of marriage. I wander back along the empty street of broken crofts and admire the neatly renovated half dozen that are home to Jill and her colleagues. I buy and post home sepia postcards of the villagers to remind myself that I have, indeed, made this voyage to the very edge of Britain.